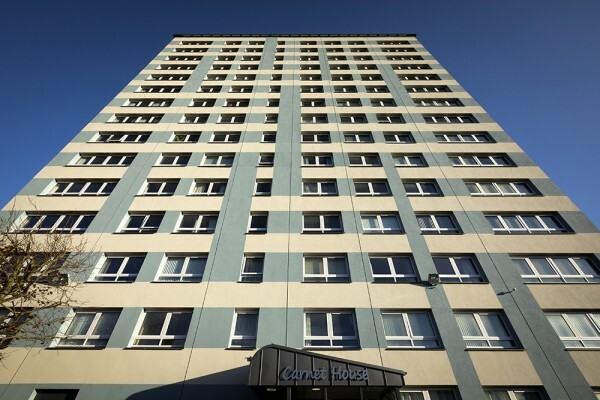 The 15-storey Carnet House building on Belfast’s Ardcarn Estate, owned by the Housing Executive, now boasts a U-value of between 0.15 and 0.23W/m²K thanks to the installation of a Sto high-performance and cost-effective insulation system, finished with a special self-cleaning external render. Paul Isherwood, Director of Asset Management at the Housing Executive, explained; “This is a 1960s building with 72 apartments. “It was being refurbished to give our tenants more comfortable homes and we wanted an insulation solution to significantly increase the building’s thermal performance and to help keep residents more comfortable and to reduce their heating costs. “Additionally, it was important the solution be applied externally to ensure no loss of floorspace inside the apartments. “We also wanted to future-proof the building and apply an external finish that would refresh its appearance and allow it to look attractive in the years ahead. Some 2,500m2 of StoTherm insulation was applied to the façades of the 45-metre tall building. This BBA certified insulation system has European Technical Approval ETA-03/0027, and it has an efficient single-leaf construction that provides excellent thermal performance whilst also protecting the external wall surface from weathering. It was fixed using StoLevell Duo Plus, a mineral bonding and reinforcing mortar. “Given the height of the building we then supported this with a secondary dowel-fix solution which added extra strength,” adds Michael Clarke of Clarke Ecowall who installed the Sto products. The insulation was finished with a 1.5mm layer of StoLotusan external render. StoLotusan is the only render which features the patented Lotus-Effect® which gives unbeatable water and dirt repellence. The surface of the StoLotusan features a unique microstructure which encourages water to run off quickly and efficiently, removing particles of dust and debris as it does. “This was a key feature as it will protect the surface from staining and marking and will keep the building looking good,” adds Michael Clarke. StoLotusan provides highly efficient protection against algae growth and also features very high water vapour permeability characteristics. Available in a range of textures and up to 800 colours, StoLotusan is the ideal partner to the StoTherm insulation system.